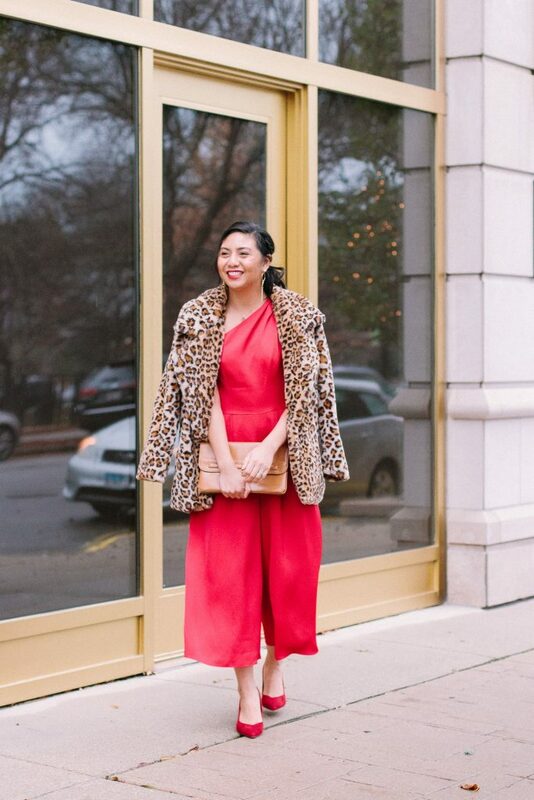 I seriously found the best red jumpsuit to wear to any holiday party! I knew when coming up with holiday outfits that I wanted to wear something red. 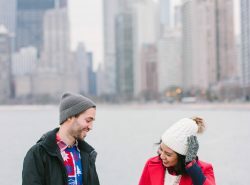 Red is the color that immediately comes to mind when it comes to the holiday season. 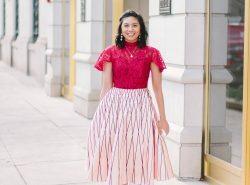 When I was online shopping, I kept looking at red dresses, red skirts, red tops, and it didn’t cross my mind to look into jumpsuits.Which is odd because you all can tell by my summer outfits that I LOVE jumpsuits. Plus, jumpsuits seem to be a great piece to wear during the Winter because your legs are mostly covered haha. It wasn’t until I saw the Gal Meets Glam holiday collection that my eyes were fixed on the Carmen jumpsuit. I knew I had to have it for the holidays. 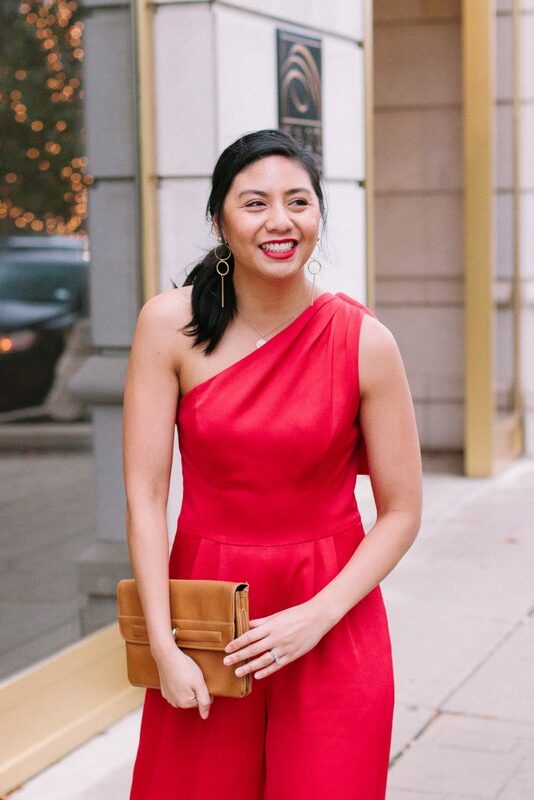 It was seriously the best red jumpsuit for the holidays! Just like all the Gal Meets Glam dresses, it is made with high-quality fabric. This jumpsuit has a satin finish and to me that gives a holiday vibe to it. Almost every holiday outfit I own has a satin finish to it. I love it because it is a jumpsuit! I’m just a sucker for jumpsuits, especially if it is wide-leg! It has the perfect length for wide-leg which is slightly above ankle. For reference, I am 5’4″. Plus it has pockets. Who doesn’t love pockets?! And can we talk about the details?! It has a one-shoulder neckline and my favorite part is the bow in the back! I usually wear my hair down, but having a back detail like the bow urges me to switch it up (in a good way of course!). The details are subtly bold. Haha, I know it is an oxymoron, but the jumpsuit has a timeless feel to it, yet the details give it more edge. Which means people will be turning heads to look at you because it is so chic! Another thing I love about the jumpsuit is that even though it is considered a ‘holiday collection’, you can pretty much wear it on any occasion. It can be perfect for a wedding (any wedding season), special event, anniversaries, engagement photos, etc! The fit is true to size. I’m wearing a size 4. Btw, it comes in pink too! And it is just as gorgeous! If I could, I would totally get it in pink! Obviously, the jumpsuit alone is just gorgeous. But I do like to jazz it up a bit and couldn’t resist wearing a leopard coat. My coat is a size small and fits true to size. It is really cozy. I did get it from SheIn and I highly recommend you reading my SheIn shopping tips. The coat is warm enough to get you to your destination, but I don’t recommend wearing it if you will be outside for a long period of time. I thought it would be fun to somewhat keep the outfit monochromatic red so I paired it with my favorite pair of red heels. If you don’t own them, buy them. You’ve seen me wear the blush pair almost every time, and I had to get it in several other colors. They’re so comfortable and very flattering to your feet. These are pretty much my go-to shoes during the holiday season. To keep the monochromatic vibe going, I obviously had to wear red lipstick. The one I’m wearing is the perfect red color! Color name is Girls Night – Classic Red. It’s red, but not daring red. Plus, it is moisturizing and toxic-free. The peppermint in the lipstick is so soothing too! Hope you all love this jumpsuit as much as I do! Ah! Red is such a GREAT color on you lady! I love the bow detail and leopard jacket too. So perfect for the holidays. The Gal Meets Glam line is absolute perfection. Love this red jumpsuit on you! So gorgeous and perfect for the holidays. I’m so obsessed with that collection! Thank you Rachel! Ahh, I’m dying over you in this jumpsuit- SO gorgeous, lady! The leopard coat is such a glam touch, too! Wow!! You look stunning, Rach!! Love the red jumper! This jumpsuit is so pretty, I really love the bow detail on the shoulder, it’s fabulous!! Thank you so much! Haha such a problem with jumpsuits! Oh my gosh I need this jumpsuit! It’s so perfect for the holiday, I love the back detail. Right?! Isn’t it the best! It is for sure a gorgeous color! Looks amazing! I love your look! You look stunning in this jumpsuit!! Oh my gosh, I love this red jumpsuit! The color is gorgeous, and that shoulder bow is so cute! This is definitely a perfect holiday look! 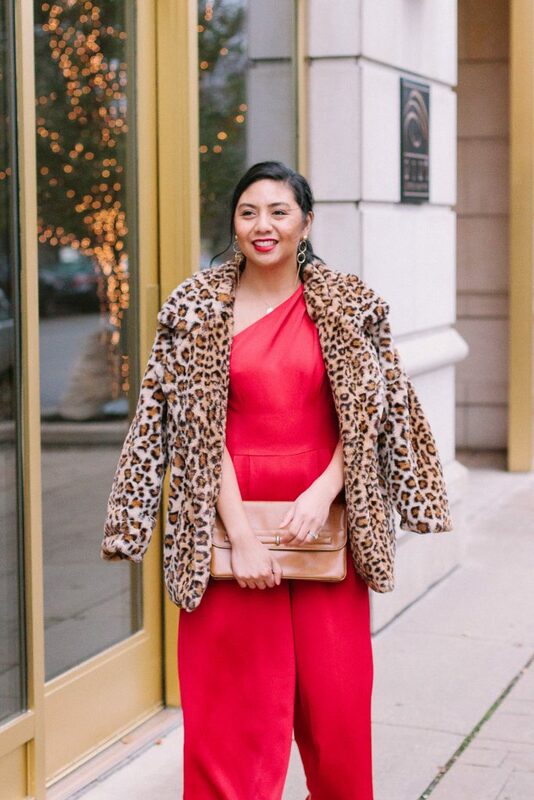 This is a perfect jumpsuit for the holidays. I love The Gal Meets Glam line ❤️. She really has beautiful dresses. Of course! you look fabulous sweeties. I love the GMG line too! Obsessed withe very dress! Oh my gosh, this is gorgeous!!! 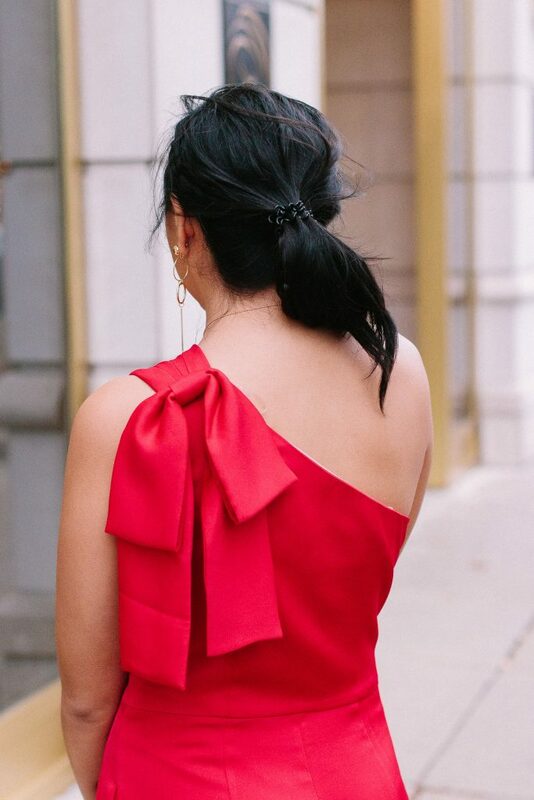 i love the bow detail on the one shoulder! Absolutely ravishing in red! Love this jumpsuit! Such a lovely jumpsuit and it looks great paired with the leopard print jacket!! Thank you so much Talyssa! This jumpsuit is stunning on you Rach!! Love the bright red! Ahhhh this is so pretty! I love that bow detail!! You look absolutely gorgeous! This jumpsuit is literally everything on you! I am obsessed with it and your whole look Rach! Thank you so much Laura Leigh! Girl, this is one of my favorite looks of yours EVER! You look absolutely beautiful!! Aw thank you so much Ashley! Omg, I love Gal Meets Glam!!!! This jumpsuit is amazing – and you can wear it for so many occasions! That line is seriously amazing! This truly is the best red jumpsuit!! Such a perfect look for the holiday season, I love the bow detail! I love it too Elise! Wow, this look is insanely pretty. And you really suit red! Thank you so much Asha! Red is 10000% your color! And I love how styled it with a leopard coat. This look is so perfect for the holidays! Thank you so much Mollie! Isn’t the GMG collection amazing?! I know I’m the same way! Everything is amazing! 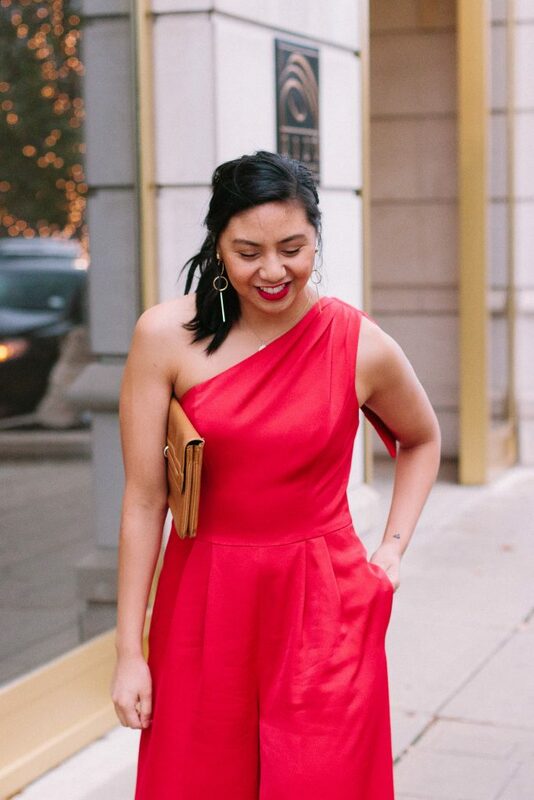 I love red for the holidays and this jumpsuit is gorgeous! So perfect! Thank you so much Kelsey! 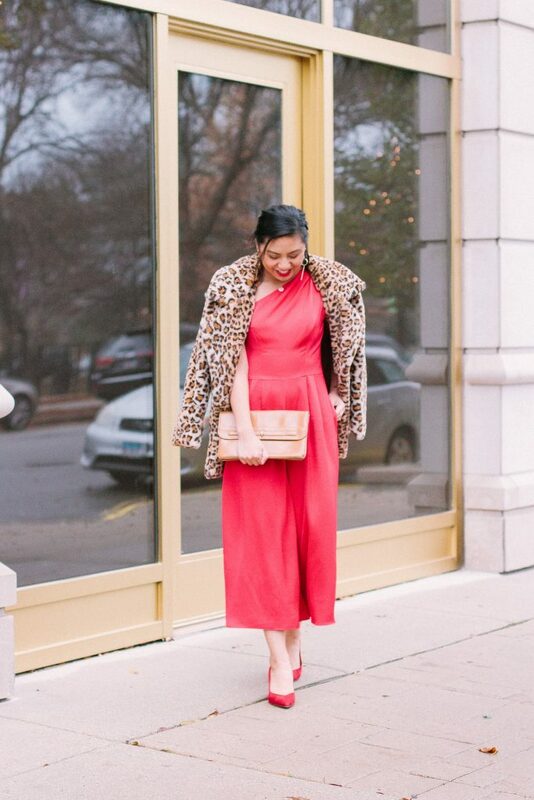 The jumpsuit alone is fabulous, but when you add the leopard coat .. it’s perfection! Thank you so much Morgan! This is such a fabulous look on you dear! I absolutely love it. I saw this jumpsuit on your Instagram and knew you and I would get along! I am a sucker for jumpsuits too. Love everything about it! Haha you are so sweet! Love that you love jumpsuits as much as I do!